Today’s Home Office related stories include the Trusted Relationships Fund, the Windrush apology and police bail orders. A broadcast segment on Sky and online coverage on ITV report that £13 million will be channelled into a scheme to help vulnerable children at risk of abuse to form trusted relationships with professionals in the community. Coverage notes that The Trusted Relationship Fund will receive money in 11 local authorities. Sky reports that councils in the Midlands, Manchester, Somerset and Rotherham have all received funding to help try and prevent young people falling into crime and abuse. But according to the piece, after years of neglect, some feel this money won't touch the sides. A short clip with Crime Minister, Victoria Atkins, was carried with her saying that “we know that any child growing up in an abusive home can affect their life chances as an adult when it comes to forming healthy relationships. The purpose of early intervention is to try to redirect these children from harm before it happens”. It is awful to think so many children have to tackle life without a strong adult figure they can confide in and that this may leave them vulnerable to predatory criminals and violence as well as exploitation and abuse. The Government is absolutely determined to help which is why the Trusted Relationships Fund will support at-risk children through projects across the country. Early intervention is so important to give vulnerable young people the best chance in life and we will make sure that those most at risk will have a positive adult in their lives. There is widespread coverage across print including in the Times, Telegraph, Guardian, Independent, Mail, FT and Sun, on the Home Secretary’s apology to 18 Windrush victims after it became “absolutely clear” that their removal or detention should not have happened. In addition, coverage notes that the Home Office confirmed it would try to contact all 164 individuals but the initial priority was to contact the 18 who were to receive an apology. 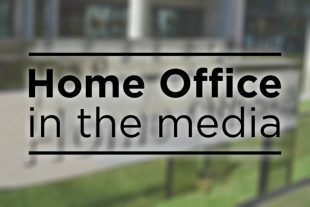 The Home Office has issued a press release which can be found here. The Times reports that suspected rapists, domestic abusers and other violent attackers are routinely being released without constraints after a fall in the use of police bail. The piece carries a Home Office statement highlighting that police still have the ability to add bail with conditions where necessary, and that reforms had ended the “injustice of people languishing on restrictive and very lengthy periods of pre-charge bail”. These reforms have ended the injustice of people languishing on restrictive and very lengthy periods of pre-charge bail, with fewer people on bail for shorter periods of time. Nothing in these reforms should adversely affect public protection. Where pre-charge bail is necessary to protect the public, including conditions attached to that bail, the police are still able to impose bail. We are continuing to make this message clear to police forces across the country. Claims that these reforms have led to longer investigation times are untrue. The most recent crime stats show that the time to resolve cases has fallen or remained the same in all but one category.